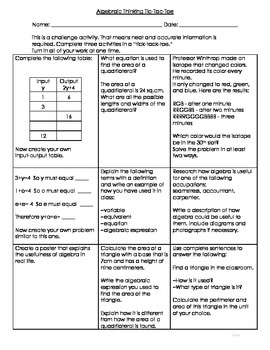 This is a challenge activity for higher level students. It can be used in place of classwork or as homework over a period of time. There are nine different activities. Students choose which three activities to complete as long as they are three in a row like tic tac toe. The activities include: input output table, find the value of the variable, writing equations for the area of a quadrilateral, finding the 30th part of a pattern, researching how algebra is useful in occupations, and calculating the area of a triangle in the classroom.